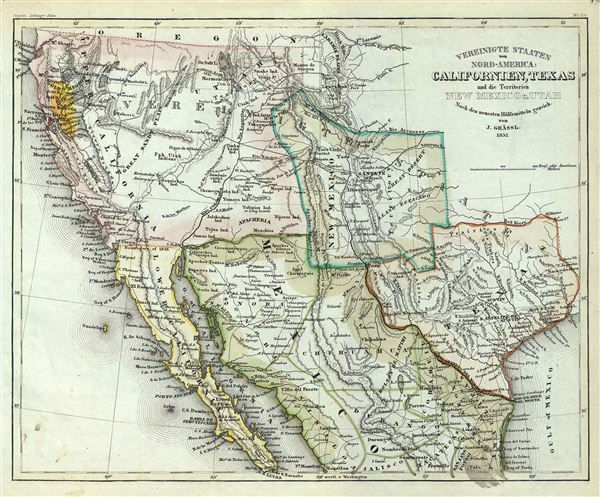 Scarce map detailing the California Gold Region offering an early configuration of the American Southwest, particularly Texas and New Mexico. An appealing, uncommon and underappreciated 1852 map of the American southwest by Jospeh Grassl and Joseph Meyer. The map covers the greater southwest from the 42nd parallel south to include all of modern day California, Utah, Nevada, Arizona, New Mexico, Texas, Colorado, and northern Mexico. Grassl presents an early configuration of this region rarely seen on maps - in fact this is the only map post-dating the Mexican American War we are aware of to depict it. The map is defined by a pre-Compromise configuration of the Territory of New Mexico, which takes center stage. Here where are seeing an early bid for New Mexico statehood as a Free State filed with congress early in 1850. The bid followed the first New Mexico Constitution, approved by the State Assembly in the same year. The state, as presented in the New Mexico constitution roughly followed those borders traditionally given to the former Mexican Intendencia of Santa Fe, was to extend eastward to about 100 degrees, northwards as far as the Arkansas River, and westward to just beyond the Sierra de Mimbres, a southern extension of the Rocky Mountains. This document appeared before the U.S. Congress in the midst of a period of extraordinary contention and rivalry. First, much of the territory claimed by the first NM Constitution was also claimed by Texas - in fact, the original Texas border, terminating just east of the Sierra de Mimbres is marked on this map, but not colorized. The second issue, one of slavery, made the creation of a New Mexico state a national issue with broad ramifications - especially as it intended to enter the Union a Free State. The Compromise of 1850 forced Texas to give up (or more accurately sell) its claims along the Rio Grande as well as its northern extension thereby placing it below the Missouri Compromise line and entering into the the Union as a Slave State. New Mexico meanwhile, was entered as a territory without congressional voting rights and thus committed as neither a Free nor Slave State. The Compromise also established the western border of the New Mexico Territory roughly along today's California-Arizona border; however, the results of the Compromise are not shown here. One can only wonder at the cartographer's intentions in rendering New Mexico according the early constitutional boundaries rejected by Congress over two years earlier. While it is conceivable that Grassl was merely copying from outdated material, such as the 1828 Tanner map of Mexico, we think it unlikely, as he would clearly have been aware of events in United States and it is inconsistent with his other generally meticulous work. It is more likely that Grassl was carto-advocating for an anti-slavery position and playing to his generally abolitionist German audience by showing support for the rejected New Mexico Constitution. In the mid-19th century there was a great deal of European interest in the western parts of the United States as a land of opportunity and new beginnings - especially in Germany from where vast numbers emigrated to the United States, in particular to Texas and the greater southwest. Also of interest is Grassl's presentation of the California gold region - here highlighted in bright yellow. Though by 1852 most American maps no longer highlighted the gold region, Grassl is once again catering to his primarily Germanic audience by presenting the American west as a land of wealth and opportunity. He identifies 'Nueva Helvetica' in this region. Nueva Helvetia, or New Switzerland, was a Mexican-era settlement established near Sacramento by Swiss pioneer John Sutter. It was here that James Marshall, one of Sutter's most trusted employees, made the historic gold discovery at Sutter's Mill. Prepared by Joseph Grassl in 1852 for issued in Joseph Meyer's Neuster Zetungs Atlas Hildburghausen. Meyer, J., Neuster Zetungs Atlas Hildburghausen, 1852. Wheat, C. I., The Maps of the California Gold Region, 1848-1857, a Biblio-Cartography of an Important Decade, 217.